The world is today a poorer place, following the immensely regretted death of Wangari Maathai, an outstanding woman, an outstanding humanist, an outstanding innovator, an outstanding civil society activist, an outstanding leader. And an outstanding mother to outstanding children, to whom I convey my emotional solidarity and support. I met Wangari in Nairobi in 1975 when I was the first Chair of the Environment Liaison Centre International (ELCI), a post in which Wangari later succeeded me. She took me to her very first tree nursery, carved out of the land on which a police station stood, already illustrating her immense powers of persuasion. Later I went out with her more than once, with a dozen or more women in a rickety minivan, to support her and to learn from her, as she spread the tree-planting revolution that became the Green Belt Movement. I have never forgotten her contagious enthusiasm, nor her calming stoicism as the minivan negotiated Kenya's rural roads that in that period occasionally resembled a riverbed! Wangari became big news in Kenya and East Africa, then Big News in the world, as she indefatigably championed the causes of Africa, of women, of the poor, of rural development, of sustainability, of peace, of democracy, of social justice, of human rights. She was Civil Society personified, even when she had a brief spell as Kenyan Assistant Minister for the Environment and Natural resources. 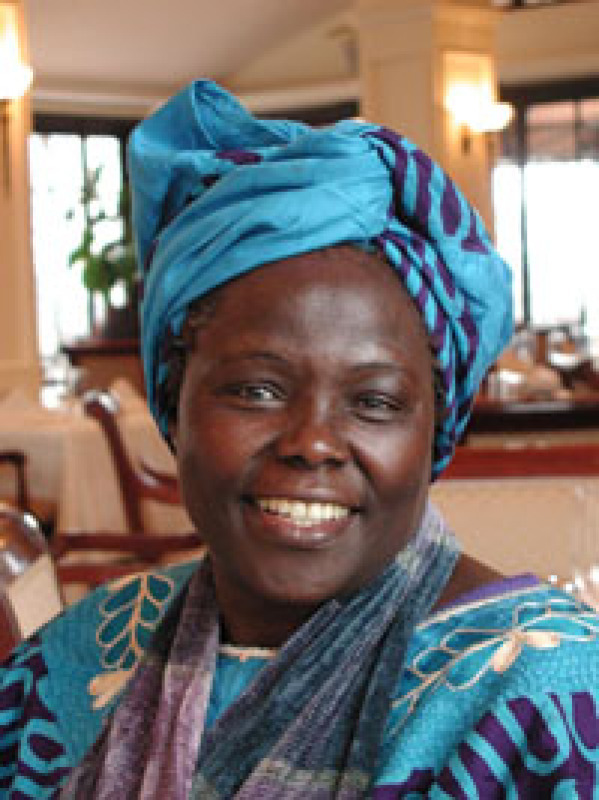 Wangari was increasingly invited to UN, academic and parliamentarian platforms to convey her messages of good sense, of hope, of determination, of human values and of change. Of course for her irrepressible activism she was vilified in some patriarchal government circles. While protecting land, forests and people she suffered beatings at the hands of police or hired assailants. 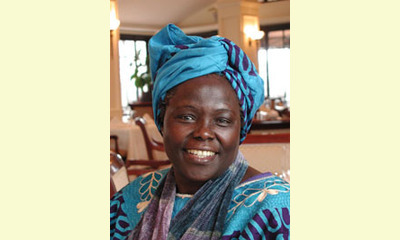 When the World Civil Society Conference (WOCSOC) met under my chairmanship in Montreal in 1999, Wangari, as one keynote speaker, publicly thanked the other keynote speaker, UN Secretary General Kofi Annan, for his interventions on her behalf when she had been so attacked in Nairobi. Nothing deterred Wangari, nothing discouraged her, except perhaps the slow pace of governmental awakening to, and response to, the environmental and sustainability crises confronting the planet . For Wangari such incomprehension and inaction was only a reason to redouble her efforts and her mobilization of civil society and academia worldwide. What more natural, therefore, that in 2004 she became the first African woman to receive the Nobel Prize, having already a decade earlier been the recipient of the “people’s Nobel”, the Right Livelihood Award. Her Nobel prize speech conveys her pride in African women’s resilience; her emphasis on justice, integrity and trust; the contribution of tree-planting to promoting a culture of peace; the need to preserve both local biodiversity and cultural diversity. She issued in that speech a clarion call on leaders “to expand democratic space and build fair and just societies that allow the creativity and energies of their citizens to flourish”. I personally had multiple further opportunities to cooperate with Wangari and to bask in her sun: UN Conferences and Commissions; the African Union Economic, Social and Cultural Council (ECOSOCC) of which she was the first president; the Union of International Associations; the World Future Council and more. She was truly a universal beacon of light. Now that that light is extinguished, what better legacy could Wangari have than the universal redoubling of the commitment of all of us to the values that she so outstandingly incarnated. This report was posted on October 3, 2011.